Cook the macaroni in boiling, salted water till al dente. 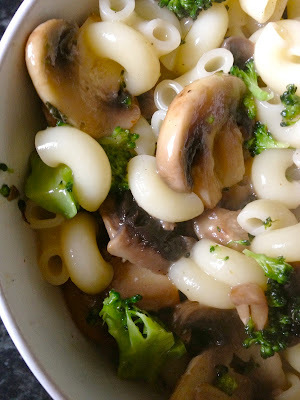 Meanwhile, in a skillet over medium heat, cook the broccoli and mushrooms with the butter for about 3 minutes or till the mushrooms are soft and the broccoli crisp-tender. Whisk together the milk, wine or juice, salt, basil and cornstarch. Pour this mixture into the skillet with the vegetables. Cook and stir till thickened and bubbley. Add the drained, cooked noodles to the skillet and stir till heated through. Sprinkle with a little Parmesan before serving. I made a note on this recipe that it tasted like it needed some white pepper or cayenne pepper. I will try it so next time.